One of Italy’s favorite desserts, and one that is often made at home, is the crostata. The characteristic crust, the pasta frolla, resembles a butter cookie or shortbread. And to be a true crostata, the dessert must use this pastry dough. In its simplest form, the crostata is filled with jam and topped with a diamond-shaped lattice before baking. This lattice is often made of “ropes” of the pasta frolla. It’s the quality of both the crust and the jam that can make this dessert something to swoon over or something to drop in the trash. A good crostata from a pastry shop can cost $15 to $20 for a modest-sized one while another of similar proportions can cost only 99 cents at the supermarket. A glance at ingredients reveals the reason for this disparity. 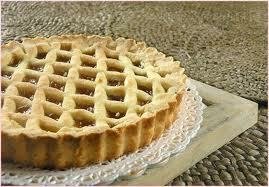 The most common jams used in the crostata are plum, cherry, and apricot, but I’ve had it with other flavors as well. I made some fig-blood orange jam a couple of years ago that was fabulous in a crostata. And while the pasta frolla filled with jam appears most often on Italian tables, this lovely pastry dough can house pastry cream topped with fresh fruit. In this case, bake the shell empty and fill it after it has baked. To bake, line the dough with oven paper (parchment paper) and fill with dried beans or pie weights to keep the pastry from puffing up too much. The pastry cream recipe in the link makes too much for one crostata, but it freezes well. You could make other fillings with fresh ricotta, chocolate, and other ingredients as well. It’s quite a delightful dough and it’s simple to make. 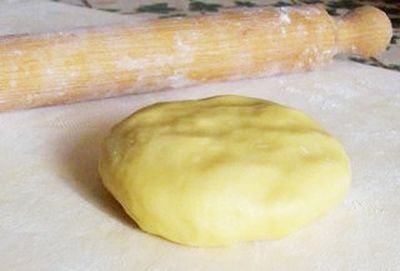 The traditional way of making this and other types of pasta is to place the flour and pinch of salt on a bread board, spreading it around with your fingers to make a well in the center. Sprinkle the sugar into the well, then the pieces of butter. Finally add the lemon rind and egg yolks and mix with your fingers until an amalgamation is achieved. Modern cooks can use the food processor. Put the dry ingredients in first, followed by the lemon rind, butter, and egg yolks. Process until just combined. DO NOT OVER PROCESS. Form the dough into a ball. If it seems too dry to shape easily, wet your hands under the tap and use these wet hands to introduce moisture to the dough as you shape it into the ball. Do not get it too wet. Wrap the ball of dough in plastic wrap and refrigerate for at least 30 minutes. It can be made the day before. Roll out to about 1/4 inch thick (or even a little more). Line an 8 to 10-inch tart shell (I prefer those with removable bottoms). With this dough, you don’t have to do elaborate crimping of the edges. Just cut it off at the top of the tin. 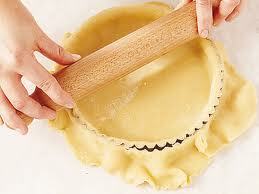 For a jam crostata, prick the bottom with a fork and spread about 1/2 to 2/3 cup of jam over the surface. Take the remaining dough and roll into ropes about 1/2 centimeter (1/4 inch) in diameter and string over the jam in a diamond pattern. Bake for 30 minutes in an oven preheated to 190 C (375 F). Most jam tarts would be too hideously sweet for me, but I can imagine a delcious one with some of the wonderful gourmet jams available. Your crust looks yummy. Oh, I hope you'll try it. Maybe with a bitter orange marmalade. That shouldn't be too sweet. This is my kind of dessert. It would be good with lemon curd, don't you think? (And not too sweet for Gayle.) Especially with the lemon zest in the pastry. I've got a tree laden down with lemons and am looking for creative ways to use them. And Persian New Year is coming up in a few weeks, bringing a houseful of guests. I usually don't make desserts like this unless I have company because I can easily eat them all myself! Oh, yes, it would be great with lemon curd, maybe with a sprinkle of toasted sliced almonds. What a good idea! I may have to try it. I'm jealous of the free supply of lemons. We get good lemons here (think Amalfi coast and lemoncello), but they can be pricey. I tried to grow a lemon tree when I first came to Rome, but my terrace doesn't get enough sun. I still fantasize.